Try this great caponata sauce for something a little different on "pasta night". It's delicious! The inspiration for the Pasta with Caponata Sauce recipe came from Sicilian tomato and eggplant relish. This is an adaptation of a terrific sauce from the Cooking Club. It is a thin, chunky sauce rather than thick like most red sauces. It really has terrific flavor and is a nice departure from the traditional. 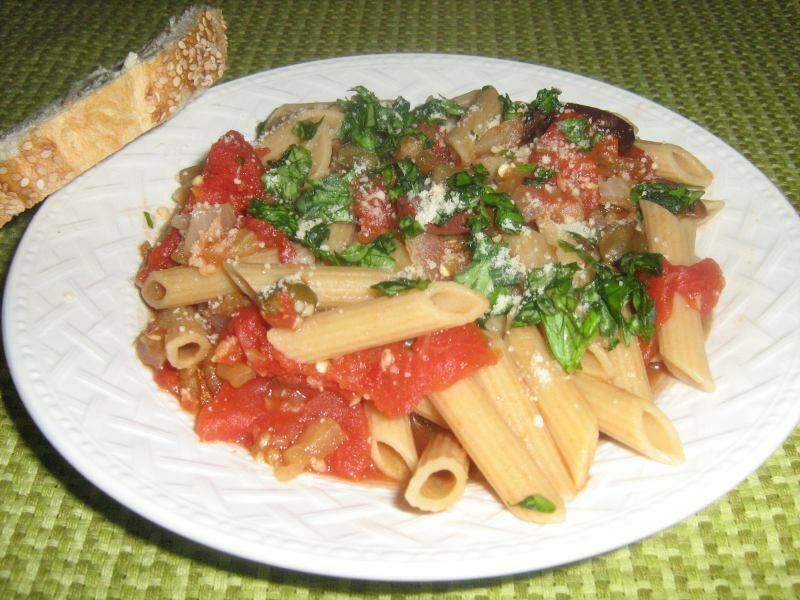 Try it with some whole grain penne, Italian bread and your favorite red. With eggplant and Kalamata olives, this pasta and caponata sauce recipe just sings with flavor! Did you know that kalamata olives are officially protected under the European Protected Geographical Status scheme? Interesting. But when you taste the caponata sauce pasta you will be glad that these olive delicacies are not on any endangered list! Meanwhile, heat oil in large saucepan over medium heat until hot. Add the onion and cook until translucent, about 3 minutes, stirring occasionally. Add the eggplant. Cook for about 5 more minutes or until tender, again stirring occasionally. Stir in the minced garlic, cook and stir for another 30 to 40 seconds. Add the tomatoes, olives, capers and crushed red pepper. Bring to a boil. Reduce heat and simmer for 15 minutes. Stir occasionally and crush the tomatoes slightly. Add the cooked pasta, toss to mix well. Serve sprinkled with Vegan Parm or nutritional yeast and topped with chopped, fresh basil. Makes about 4 (1 3/4 cup) servings. Per serving: 350 calories, total fat 9g, saturated fat 2.5g, protein 13g, carbs 59g, cholesterol 5mg, sodium 1600mg, fiber 8.5g.